Every rabbit needs a home within your home. This is a place where they will sleep, eat, and even play. For some rabbits, this may be a cage, others may call and exercise pen home, or very lucky bunnies may have an entire room to stretch out in. 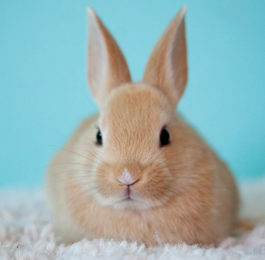 No matter what kind of space you have or what budget you can spend on a rabbit cage, your pet bunny will require a minimum amount of space and daily exercise to be healthy and happy. This article covers all the options available (including rabbit cages and exercise pens) so you can decide which one will work best for your home and your pet. Rabbits should be kept indoors where the air temperature can be controlled and they are safe from predators and the stress of outdoors. All of our cage and housing recommendations on this page are for indoor house rabbits. The first thing to take into consideration is the cage’s size, which we will cover in its own section below. Then you want to consider what the cage is made of. Generally, you want to avoid any cages with a wire floor. 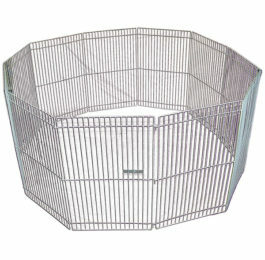 Many cages marketed for rabbits come with these wire floors and a pan underneath as a way to make them easier to clean. These wire floors are actually bad for your rabbit as they can damage their feet and cause sores. If you do have a cage with a wire floor you should provide them flat and sturdy surfaces to rest on like a tile, piece of wood, or cardboard. 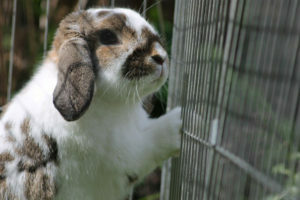 The cage should have a door that your rabbit can easily come and go from inside the cage during exercise time. You’ll also want to make sure the cage has good ventilation so your rabbit does not overheat during warmer months. Size is one of the most important requirements for a rabbit’s cage. You should give your bunny (or bunnies) as much space as possible for their home. Many experts recommend a living space at least 4 to 6 times the size of your rabbit. I know many people do not have enough room in their house to dedicate that much space to a cage or pen for their rabbit. Instead, you can have a smaller cage and make sure your rabbit has access to a larger space (like an exercise pen or a bunny proofed room) for several hours of exercise and play time each day. If you’re looking for specific measurements, most rabbit experts recommend at least 8 square feet of cage or enclosure space in combination with 24 square feet of exercise space. That size will work well for a single rabbit or a bunny pair. Your rabbit will require about 3-5 hours of exercise time each day. The height of your cage should be tall enough for your rabbit to stand on their hind legs without its ears touching the roof. Usually, a height of at least 2 feet should be good for most breeds. If the cage has multiple levels, they should at least have some space where they can fully stand uninhibited. 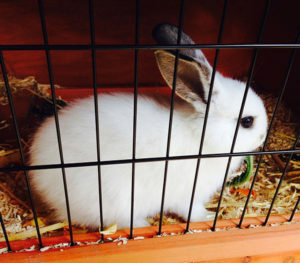 Most of the rabbit cages you see in pet stores–especially starter cages–are not appropriate for housing rabbits long term (though they may be OK for travel or temporary housing). We have recommendations for appropriately sized rabbit cages in the next section. Can my rabbit live loose in my home like a cat or dog? If you are new to rabbit ownership or have a new bunny in your home, I do not recommend this. Before you can even consider letting your rabbit run loose 24/7, your entire house will need to be bunny-proofed. You will also need to make sure your rabbit is litter trained and comfortable enough with the house to not get in trouble when you’re not around. Once you get to know your rabbit and understand their behavior, you may eventually decide to let your bun live “free range” in your home. Even at that point, they will still need a “home base” where they sleep, eat, and can go hide if they’re feeling stressed or in danger. A cage with a door that is always open works well for this. It is very tricky to find rabbit cages that meet the minimum requirements for a rabbit’s needs, especially for larger rabbit breeds. These rabbit cages work well for small rabbits and can work for larger rabbits in conjunction with proper exercise time or an exercise pen extension to the main cage. Finding a good rabbit cage is so hard that it’s not surprising our top choice isn’t quite a cage. If you’ve heard about DIY x-pen cages for rabbits, SONGMICS sells an entire kit with everything you need to make your own (including a rubber mallet!). Thanks to the included instructions, you just have to follow along to build your own x-pen bunny cage. In addition to the wire panels, the kit has plastic connectors to hold them together, along with zip ties for extra safety. There’s also non-slip pads you can put on the “foot” connections to prevent the cage from slipping around on hard surfaces. Because it’s customizable, you can change up the layout or even make the cage larger by buying additional panels. You will need to provide some sort of solid surface for the second level floors as the wires are bad for bunny feet. As long as you buy the extra large size, this rabbit cage from Living World will work well for many rabbits. They call it a “hybrid cage” because it’s made from a solid, plastic base (with a solid floor to protect your rabbit’s precious footsies) and wire walls and roof for good air ventilation. To access your pet bunny, the cage features a sliding side door they can hop in and out of and the roof opens up to easily reach in for cleaning or picking up your rabbit. Some reviewers have said their rabbits figured out how to open the side door, so this cage may not work for you if your bun is a troublemaker. The cage will ship flat and require assembly, though no tools are required. 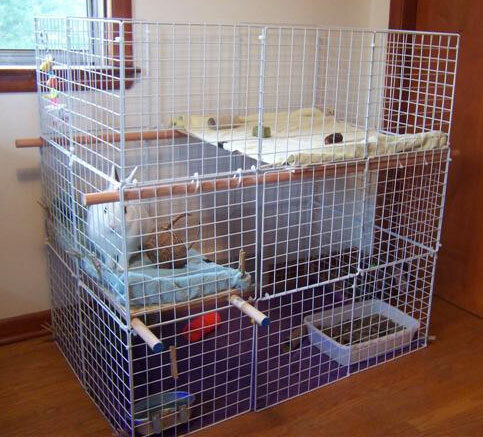 Some owners have even connected two of these cages together to create double the living space for a pair of bonded rabbits. This cage comes with some accessories that you may want to replace, including a “balcony” which is a shelf with ramp creating a second floor and a “tip proof” food dish, plus a plastic water bottle and a hay rack. 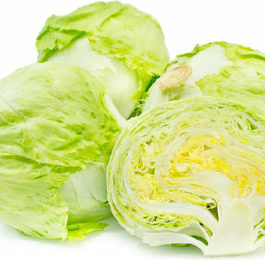 Yes, I know. This is a dog crate. But sometimes exotic pet owners have to think outside the box to find appropriate and affordable cages for their rabbits. The nice thing about these dog crates is they are more affordable than many cages and are collapsable which is great if you travel with your rabbit. To meet your bunny’s needs, this crate has plenty of room to stretch out. The metal construction walls will keep your rabbit safely contained. The floor features a removable plastic pan, which makes cleaning easy and protects your rabbit’s feet from sores. This crate also comes with a removable divider panel, though you probably won’t need it. The 48″ model (which is the one you should buy for your rabbit) comes either with a single door or a double-door option. I would recommend the double door for the ease of cleaning and accessing your rabbit. This rabbit cage from Ferplast is a great option for a single bunny. It comes with the normal rabbit cage, plus a detachable wooden hutch to give your bunny a safe places to sleep. The plastic base features a smooth floor with tall guards to keep messes inside the cage. The wire walls and roof allow for plenty of ventilation, and the one side opens up entirely to make it easy to get inside to clean. This cage comes with some accessories that you may not want to use, including a plastic hay feeder, a water bottle, and a food bowl with a plastic shelf. We only recommend using this cage with the attached hutch because otherwise, the cage is too small. If you don’t like the idea of a wooden hutch (they often hold odors and are difficult to clean), Ferplast makes a version with a connecting wire section instead. You could also buy two of these cages and hook them together (without the hutch) to create double the living space. You may find building a home for your rabbit is easier and less expensive than buying a rabbit cage. This allows you to create a custom home of any size for any number of rabbits. Many rabbit owners have used “nic cubes”–Neat Idea Cubes or wire storage cubes–to build elaborate cages for their buns. These cubes are easily purchased online or in stores like Wal-Mart or Target. While they’re meant to build customizable shelving units for closets or basements, they’re absolutely perfect for build a rabbit condo. It does require a little bit of creativity, but the only materials you need are the NIC cubes, zip ties or cable ties to secure each panel and material for flooring and shelves (or buy this kit). For flooring, a piece of linoleum or a tarp will work well for messy rabbits who don’t have great litter habits. Corrugated plastic (like those used for outdoor signs) can work well if you find a large enough sheet that you can cut to size (try contacting local custom sign stores to see what sizes they have). If you want a second (or even third) floor in your bunny condo, you will need to build shelves. The shelves will have NIC cubes as their base, reinforced with wood planks or wooden dowels underneath them. Since rabbits should not be on wire floors, you will need to cover the panels with wood, linoleum, tiles, or other solid materials. If your rabbit isn’t a carpet chewer, carpet or other thick fabrics may be a good option. If you have high shelves, you may want to provide a ramp or ladder for young or elderly rabbits to hop up. Don’t forget, once you’ve built your bunny condo, you’ll need lots of rabbit cage accessories to keep your bunny happy. An exercise pen is a great option to house your rabbit, either as an extension to your bunny’s cage (creating a yard) or to work as a cage itself. Exercise pens are great to fence off a corner of a room or create a freestanding pen for your rabbit to live in. You may need to add a tarp, rug, or another type of “flooring” to protect carpet or hardwood floors from your messy bun. Otherwise, you can just set up the pen and add all the cage accessories they need. There are exercise pens on the market specifically for small pets, but often pens meant for dogs work well, are easier to find, and a little larger in size. Usually, a pen at least 24″ or 2 feet in high is best, though you may want to purchase a taller one if you plan on adding houses your rabbit can jump on. The same with cages, we recommend getting the largest exercise pen you can accommodate in your home. More space is always better for your bunny. Here are a few different exercise pens that work well for rabbit cages. They can either be used in conjunction with a wall or corner to create extra space or set up as a freestanding pen to keep a nibbling rabbit away from walls. This x-pen from Midwest Homes for Pets is marketed for dogs, but it works perfectly as a rabbit enclosure and cage alternative. Available in a variety of heights, each pen provides 16 square feet of enclosure area for your rabbit to play or live. Set up is easy and requires no tools. It also comes with ground anchors if you plan to use it outside in your yard. This sturdy metal pen from OxGord is another great option for housing your bunny. Made from 8 metal panels, this pen is easily assembled in any combination or set-up. One of the panel includes a doorway with two locking closures to keep your bunny safely inside. This model only comes in one height (24″) but that should be good for most rabbits. If you ever want to expand your enclosure, it’s easy to add additional panels. The metal is coated with a rust-resistant material, which is great if you use this exercise pen outdoors or if your bunny is messy with their litter box habits. This pen also easily breaks down, so it’s great for people who travel and want to bring a larger enclosure for their rabbits. Check out more recommendations in our article on exercise pens for rabbits. A cardboard pet house can be used to create levels for your rabbit inside of the pen and provide cozy spaces for them to sleep. You can either build one yourself from cardboard boxes or there are many available marketed towards cats that work great for rabbits. 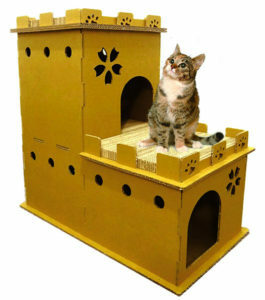 This cat castle (pictured left) from Napping JoJo is an excellent option that adds multiple levels to an exercise pen. Check out more options for rabbit houses and tents. Now that you’ve picked out the perfect cage for your bunny, learn how to clean a rabbit cage.